Catwalk Systems are primarily used to access machinery or conveyor systems or used as elevated aisles ways. Catwalk Systems are normally rated at 75 PSF and are for personnel only and not for storage. 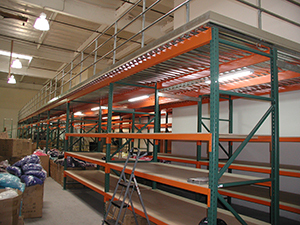 Catwalk Systems can change overhead space into useful storage space in your warehouse. 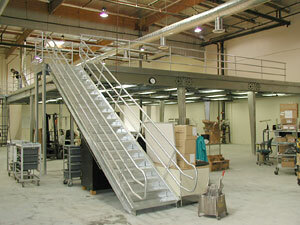 Shelf Master can design and install any type of catwalk system for your warehouse. Our Affordable catwalk system is built out of strong light-weight steel. Structural mezzanines can double or triple your usable floor space with a modular designed, structural mezzanine or modular office. Use to add office space, increase storage capacity or production area. There are many decking options; wood or B-Deck, Diamond plate, Bar Grating, Plank Deck and concrete. The heavy duty racking becomes the structural support for the mezzanine. 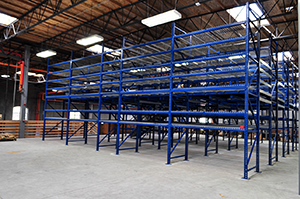 This innovative type of storage system is economical than an ordinary mezzanine system. The system can either be used for multi-purposes such as office space or additional shelving storage system to increase storage capacity.